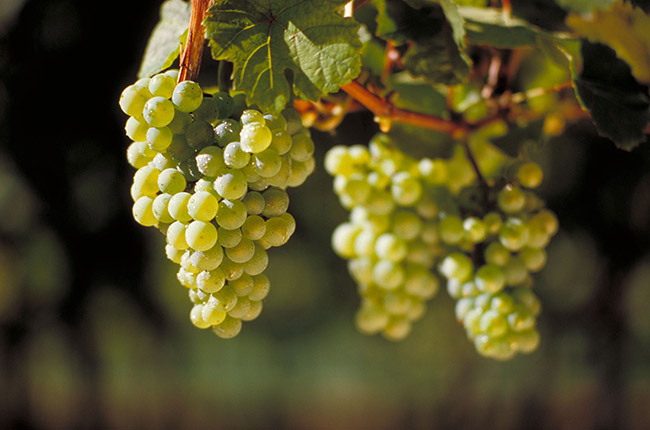 The one true, noble non-French grape variety, Riesling produces wines that range from bone dry to lusciously sweet. It spent much of the 1990s and 2000s on the sidelines, particularly in the UK, due to the quantity of cheap Liebfraumilch and array of wannabe Rieslings (Olasz, Welsch, Laski, Riesling Italico) on the market – all of which tarnished Riesling’s reputation in the eye of the consumer. Nowadays things are back on track and the Riesling revival is well underway. Great examples are produced all around the world, from the Eden Valley in Australia to South America – and not forgetting the classic Rieslings from the Rheingau in Germany, Wachau in Austria and Alsace in France. Riesling generally produces elegant wines with crisp lime, green apple and peach flavours. In the Mosel it is said to become slatey, which is easier to describe as ‘minerally’, and develops honey, petrol and kerosene-like flavours. In Alsace it can be more floral and perfumed, while Australian Riesling, particularly from the Eden and Clare Valleys, starts out lime and lemon-like and develops a minerally, kerosene character with age. Fine dry Riesling is not only increasingly fashionable in Germany, but in Alsace and Austria too. . The finest dry German Rieslings can be labelled as ‘Grosses Gewächs‘. Late-ripening Riesling’s heartlands are the steep Mosel and Rheingau valleys of Germany, where it is labelled as Kabinett, Spätlese, Auslese, Beerenauslese or Trockenbeerenauslese. The wines can be richly textured and full of lime, apple and marmalade flavours with a honeyed character. As a cool-climate variety par excellence, Riesling has not fared as well in the new world, but there are a handful of locations where it has been shown to do well – most notably the Eden and Clare Valleys in South Australia, Mount Barker in Western Australia, New Zealand’s South Island, Washington State in the USA, and South Africa’s Constantia. Alsace’s unique climate comes from the fact that its terraced vineyards at 200m-400m altitude lie in the rain shadow of the Vosges mountains. Biodynamic farming has led to healthier grapes and earlier harvesting. Diverse, well-drained soils are ideal for imparting a wide variety of alluring characteristics to Alsace’s perfumed and deliciously full-bodied, textured, dry Rieslings. There is also the sweet vendange tardive style, and the lusciously rich sélection de grains nobles. Alsace’s best producers include Boxler, Deiss, Weinbach, Hugel, Josmeyer, Léon Beyer Ostertag, Schlumberger, Trimbach and Zind-Humbrecht. One of Germany’s mildest, driest and most fertile regions, Pfalz’s vineyards lie over a patchwork of ancient and more recent soils. Pfalz’s predisposition towards dry Riesling combining full body, substance and richness of fruit (sometimes described as yellow fruit) with finesse and minerality, is aided and abetted by a beneficial ripening climate. Today’s roll-call of top producers includes: Bassermann-Jordan, Bürklin Wolf, Von Buhl, Christmann, Dr Wehrheim, Knipser, Koehler-Ruprecht, Okonomierat Rebholz, Philipp Kuhn and Von Winning. There has been a complete turnaround in the image of Germany’s Rheinhessen as a mass-market producer of vapid, cheap Liebfraumilch, thanks to a new generation of committed growers. The Roter Hang strip comprises Nierstein and Nackenheim in the dramatic Rheinterrasse vineyards. The Wonnegau is where Keller and Wittmann conjure up rich yet pure, complex Rieslings structured by elegant minerality. Top producers here include: Battenfeld Spanier, Dreissigacker, Fauth, Geil-Bierschenk, Gutzler, Gunderloch, Huff, Keller, Kühling-Gillot, Pfannebecker, Schätzel, St Antony, Spiess, Stepp, Thörle, Wagner-Stempel, Winter and Wittmann. Compact and scenic, the Rheingau has for years been regarded as Germany’s noblest wine region. Its proximity to the markets of Mainz, Frankfurt and Wiesbaden and its historic grand castles, aristocratic estates and famous monasteries – not forgetting one of the world’s leading viticultural institutes at Geisenheim – has helped elevate the Rheingau to the top of the pile. Approximately 80% of the Rheingau’s south-facing vineyards slope gently down to the Rhine, the best Rieslings being firm, often apricot-laden and refreshingly dry and intense, with mineral qualities. The best growers include: August Kesseler, Eva Fricke, Franz Künstler, Georg Breuer, Graf von Kanitz, JB Becker, Johannes Eser, Josef Leitz, Peter Jakob Kühn, Prinz, Querbach, Reiner Flick, Robert Weil, Schloss Johannisberg, Schloss Reinhartshausen, Schloss Schönborn, Schloss Vollrads, Spreitzer and Wegeler. One of the driest German regions, protected by the Rheingau and Hunsrück ranges, Nahe is an area of great geological diversity. Its Rieslings vary from spicy, full-bodied and long-lived, to racy and dry, with flavours including apple, peach and more exotically zesty notes. Dönnhoff apart, Nahe greats include Emrich-Schönleber, Hans Crusius, Schäfer-Fröhlich and Schlossgut Diel. The Mosel is one of Germany’s and the world’s most picturesque, fascinating and charming wine regions, with vineyards clinging to steep and rocky, heat-retentive slopes above the Mosel river and its tributaries. Characterised by an Atlantic climate with cool summers and relatively mild winters, its mainly weathered Devonian slate soils impart a mineral character in styles varying from dry and fine-boned to intensely rich and sweet, with piercingly fresh acidities and relatively moderate alcohol levels. According to Haeger, Mosel Rieslings tend to be ‘marriages of slatey, mineral-rich flavours with sensational aromas not primarily derived from fruit but instead from floral and herbal elements of their aromas, steely acidity and delicate structures’. The roll-call of top producers includes: Clemens Busch, Dr Loosen, Forstmeister Geltz-Zilliken, Grans-Fassian, Heymann-Löwenstein, Immich-Batterieberg, Karthäuserhof, Markus Molitor, Maximin Grünhaus, Reichsgraf von Kesselstatt, Reinholdt Haardt, Schloss Lieser, Sybille Kuntz, Thomas Haag, Van Volxem and Willi Schäfer. Baden produces some fine Rieslings, most notably those of Andreas Laible and Schloss Neuweier. Full-bodied and often bone-dry, firm and earthy, Franken Rieslings (in the distinctive squat bocksbeutel bottles) are considered to be among the most masculine of Germany’s wines. Top growers include Bürgerspital Würzburg, Horst Sauer, Johann Ruck, Juliusspital Würzburg and Schmitt’s Kinder. Riesling is an important variety in Württemberg, with vigorous, rustic flavours – Beurer, Dautel, Fürst zu Hohenlohe-Oehringen, Graf Adelmann, Schnaitmann, Wachtstetter and Wöhrwag make particularly good wine. Along with Sachsen, Saale-Unstrut is Germany’s most northerly wine region and also one of its smallest. Lying above the 51st parallel, Sachsen covers just under 500 hectares. The Rieslings here are relatively light but can be quite rich, pure and mineral. Good wines are made by Günter Born, Lützkendorf, Pawis, Karl Friedrich Aust, Schloss Proschwitz, Schloss Wackerbarth and Zimmerling. Riesling’s second most important habitat after the Rhine basin is the Danube basin, and in particular Lower Austria (Niederösterreich) and the Wachau, Kremstal and Kamptal. The terraced vineyards of the Wachau are pre-eminent, with 16% of Austria’s vineyard surface planted to Riesling. In its steep, thin, rocky soils and with cool temperatures, they are aromatic, distinguished, lean, dry and mineral. The more loamy soils of neighbouring Kremstal are home to slightly gentler and plumper Rieslings, while the grands crus of Gaisberg and Heiligenstein in the Kamptal can produce elegant, complex dry wines. Top growers include: Bründlmayer, Emmerich Knoll, FX Pichler, Franz Hirtzberger, Franz Prager, Freie Weingärtner Wachau, Jurtschitsch, Loimer, Martin Nigl, Nikolaihof, Pichler-Krutzler, Rainer Wess, Salomon Undhof, Schloss Gobelsburg and Stadt Krems. The deliciously dry, lime-flecked and toasty Rieslings of the Clare and Eden Valleys in South Australia are unique. According to Jeffrey Grosset: ‘Clare Valley Riesling is generously flavoured, dry, limey, usually quite fine, reflecting the warm sunny climate.’ Polish Hill River’s mineral qualities in particular bring greater palate persistence. Next to Clare, the Eden Valley can produce mineral, bone-dry Rieslings from sites such as the rocky Steingarten, while there are growing pockets of excellence in Frankland River in Western Australia, in parts of Victoria and in cool-climate Tasmania (also a producer of gorgeous, luscious sweet Riesling). Best Riesling producers include: Bay of Fires, Cooper Burns, Dandelion Vineyards, Frankland Estate, Jacob’s Creek (Steingarten), Jeffrey Grosset, Kilikanoon, Larry Cherubino, Leasingham, Leeuwin Estate, Mac Forbes, McGuigan (The Shortlist), Mount Horrocks, Peter Lehmann, Pewsey Vale and Pikes. The area under Riesling vine in New Zealand has grown rapidly to 1,000ha. While the Australian style is predominantly dry, New Zealand Riesling mirrors Germany with validity in both dry and sweet styles. Indeed, excellent producers such as the Finns of Neudorf in Nelson, the Donaldsons of Pegasus Bay in Canterbury, Nigel Greening of Felton Road and Auburn in Central Otago as well as Framingham in Marlborough make both a dry Riesling and the sweeter, lighter, more Mosel-style Riesling. Good as these wines can be, however, they have yet to reach the heights of their German peers. Top producers include Auburn, Felton Road, Framingham, Greywacke, Neudorf, Pegasus Bay and Pyramid Valley. Riesling is grown in three main areas of North America: the Great Lakes, encompassing the Finger Lakes and Lakes Ontario and Michigan; the Columbia River Basin, which brings Washington State, Oregon and British Columbia into play; and California. Yet there are signs of a move towards drier styles, and delicious wines at that, in Ontario’s Niagara Peninsula, around Okanagan Lake in British Columbia, and in parts of California and Oregon. Delicately luscious Riesling ice wine from the likes of Inniskillin is a Canadian forte. Good producers include: 13th Street, Cave Spring Cellars and Henry of Pelham in Canada’s Niagara Peninsula. Wild Goose in British Columbia. Charles Smith and Chateau Ste Michelle in Washington State. Anthony Road, Dr Konstantin Frank, Falling Man, Hermann J Wiemer, Lamoreaux Landing and Red Newt in Finger Lakes, New York State. Black Star Farms and Chateau Grand Traverse in Michigan. Brooks in Oregon. Kick-On Ranch, Navarro, Smith Madrone, Stony Hill and Tatomer in California.